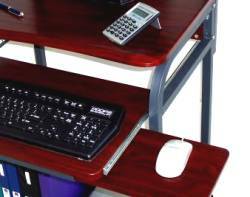 This 24" wide compact desk will fit anywhere and can even be used as a corner desk. It has a generous space for the CPU, printer and monitor and includes a sliding mouse tray. 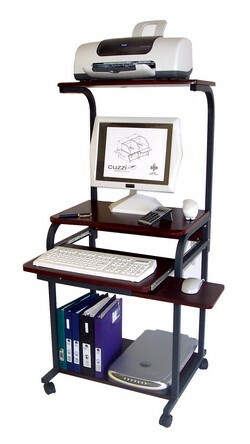 Sturdy and mobile, add this computer cart to your current desk to create an L-desk work area. 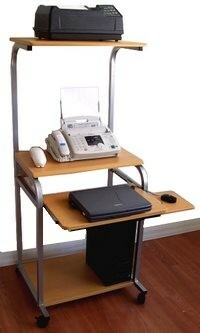 The top printer shelf is removable, as shown below. 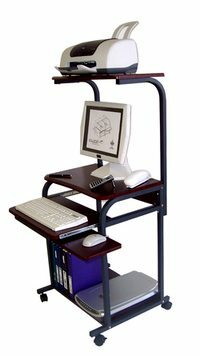 This computer cart has comes with a recessed tabletop for you to use a laptop on the keyboard shelf, at a true-ergonomic typing height. 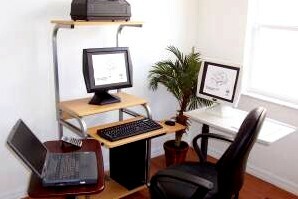 When done with your work, simply close the laptop and stow it away, pushing the shelf in under the tabletop. The mouse tray can be used to the left or the right. 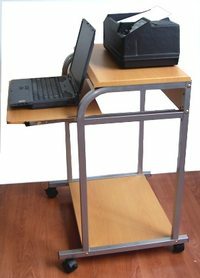 Easily create a flexible working space in any small office area by combining different CUZZI computer carts. - Durable construction and design.